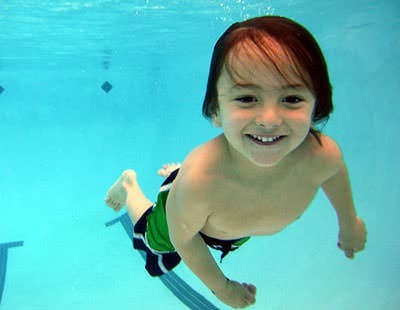 Starting children in swim lessons early makes the learning process much easier. With consistent, ongoing lessons, babies and toddlers can be moving and breathing in the pool independently by the time they’re three or four and even begin learning some basic swimming strokes. The students have a lot of fun learning how to swim and becoming safer (never consider them “pool safe”) as they develop their water skills and learn a respect for swimming pool safety rules and their behavior in and around the water. Blue Buoy’s swim instructors are all experienced, 19 years of age and older, and are permanent members of the Blue Buoy Swim School family in Orange County, with the expectation that they will be here to work with your child for many years to come. Our swim teachers undergo comprehensive theoretical and hands-on training through Blue Buoy’s internationally renowned swimming teaching philosophy and methods, and all our teachers are CPR & First Aid certified. Our instructors’ expertise and passion for teaching swimming has made Blue Buoy Orange County’s most recommended swim school. Our exceptional teaching methods are tailored to meet each child’s needs whether they are enrolling in swimming classes for babies, toddlers, kids, or want swim training to be more competitive. Blue Buoy’s outstanding swim instructors, customized facilities, and positive reinforcement will help your child succeed. Small swim classes make it possible for our swim instructors to give each child the attention needed to best help them learn. The shallow indoor pool and large outdoor pool located at our Orange County swim facility are both kept bathtub-warm, provide the perfect environments for your children to learn how to swim and improve their skills. We offer swim lessons throughout the week in the morning, afternoon, and early evening (Mon-Thu 9a-8p, Fri 9a-5p, and Sat 9a-1p) so that you can schedule a regular weekly lesson time that will fit your busy schedule. We include a 10 minute play/practice time before or after every class. We also encourage all of our enrolled students to take advantage of free Open Swim times so they can practice the skills they are learning in lessons. Our helpful office staff is here to help with your busy life. We provide flexible scheduling and generous absence and make-up policies will make your and your child’s experience at Blue Buoy Swim School in Orange County, both enjoyable and effective. We have three swim class options for children under age three: you can start with Parent & Me, and then switch over to a Semi-Private or Private class when you and your child have acquired the swimming skills to progress. Children of any age can start directly in semi-private or private lessons. You can schedule lessons for once or twice a week (or more). Many students start lessons with a swim instructor twice a week. Once they’ve built a foundation, some students attend classes once a week that fits both your child’s needs and your schedule. The important thing when enrolling at our Orange County swim school is to find the class and schedule with the best fit for you and your child. Please keep in mind that ongoing swimming classes for kids are particularly important for developing & retaining their skills in the water. Call Blue Buoy Scheduling Office to schedule your FREE TRIAL LESSON!